Note: Be aware that using a non Canon adapter may invalidate your waranty or may damage your camera. You use these adapters on your own risk. We write this note that you cannot claim that we told you to use non Canon adapters. We just publish a personal report by Paul Calwell who does not have an issues so far. There incedents known that may be related using non Canon parts. 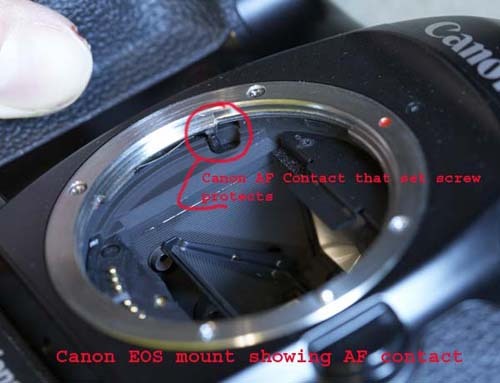 With all the concerns recently of possible damage to the AF control by the use of “non-Canon” lens adapters, I wanted to post this quick article to address some of the concerns. 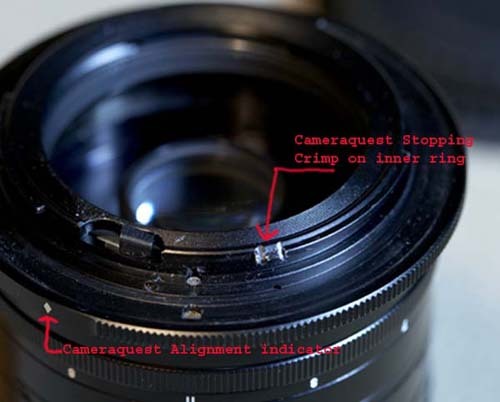 Whenever you use a non-Canon lens adapter, there is always a risk of damage however it should in my opinion be no more risky than using a OEM lens on your camera as both are using a lens adapter that wasn’t made by Canon. After following up on some of the posts regarding the damage, one term kept coming out, “stopping set screw”. I wasn’t sure exactly what this was and did some research on my own equipment. I quickly learned the stopping set screw’s purpose and what the cause of the damage may have been from. All the Canon lenses I own have a stopping set screw. At first I wasn’t really sure how this screw worked in conjunction to mounting or un-mounting a Canon lens. 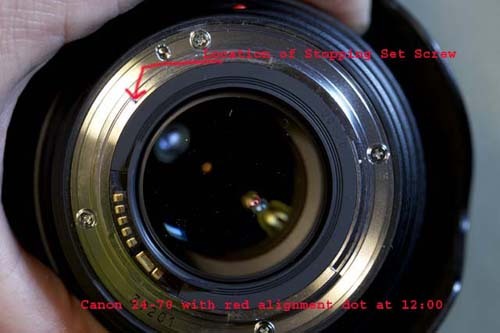 In the picture below you will see the stopping set screw on a Canon 24-70 lens. Look at the 2nd image where the red alignment dot is at the top (12:00 o’clock) and you can see that the location of the set screw is about the 10:00 o’clock position on the mount. On closer examination of all my Canon lenses, (100mm macro, 70-200mm IS, 28-105mm, 24mmTS-E and 45mm TS-E) I noticed all had the exact same stopping set screw in the same spot. I then took my 24-70mm and started mounting and un-mounting it which is something I do hundreds of times on a shoot. I realized immediately what the stopping set screw did. 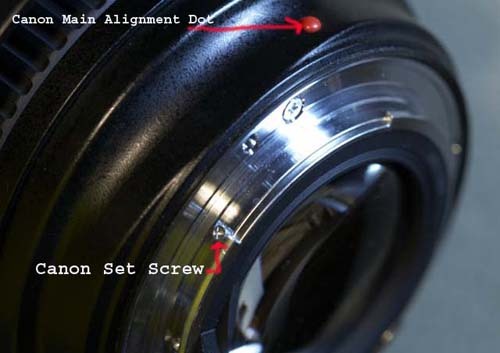 The purpose of the screw is to stop you from twisting the lens too far to the left (counter-clockwise) while removing it. It doesn’t have anything to do with mounting the lens. As you remove the lens, when the two red alignment dots line up you will feel a click. The click is the stopping set screw engaging and stopping the counter clockwise motion from going any further and causing damage. If you have a lens adapter without this stopping set screw, then it would be possible to continue to twist the lens counter-clockwise and do damage to the AF pin. In the picture show below, you can see the EOS AF pin. This pin on an EOS mount is just past the 10:00 o’clock position and appears to be made of a plastic/rubber material. I point this out as it was quickly apparent to me that this pin would not hold up well if metal was pushed against it, like the metal of a lens mounting ring. I noticed that of the three, only two were designed with some form of a stopping set device, Zoerk and the Cameraquest. 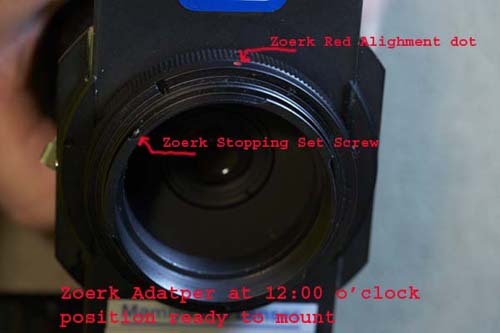 In the next series of images, I have taken close ups of both the Zoerk and Cameraquest showing how they have implemented a stop in their design. 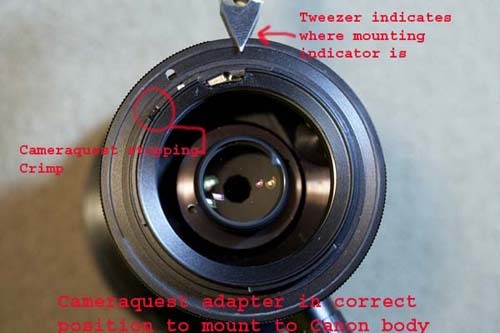 Here is the Cameraquest adapter, note that Cameraquest uses a bend or crimp in the mounting flange, at the same point where Canon would have put their stopping set screw. The crimp is very pronounced and not something that is going to be bent backwards. 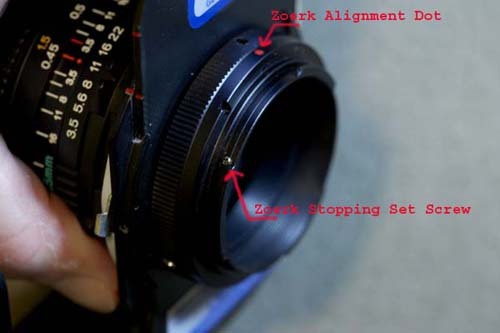 On the Zoerk adapter, there is an actual screw set in the basically the same manner as how Canon mounts theirs. The Canon screw is more substantial but the Zoerk design does hit the point and stop the rotation. Unfortunately, my DSLReXchange adapter that I have doesn’t have any form of a stopping set screw. I would have to say at this point that until an improved design becomes available that I would not recommend the use of this adapter as it would be possible to turn it past the normal stopping point and do damage to the AF engagement pin. I hope that this brief article will give people enough information to make the correct decisions when considering the use of lens adapters. In conclusion, make sure that there is some form of a stopping screw or crimp at the 10:00 o’clock position on the adapter in question.